Ferroptosis is a novel type of cell death with distinct properties and recognizing functions involved in physical conditions or various diseases including cancers. The fast-growing studies of ferroptosis in cancer have boosted a perspective for its usage in cancer therapeutics. Here, we review the current findings of ferroptosis regulation and especially focus on the function of ncRNAs in mediating the process of cell ferroptotic death and on how ferroptosis was in relation to other regulated cell deaths. Aberrant ferroptosis in diverse cancer types and tissues were summarized, and we elaborated recent data about the novel actors of some “conventional” drugs or natural compounds as ferroptosis inducers in cancer. Finally, we deliberate future orientation for ferroptosis in cancer cells and current unsettled issues, which may forward the speed of clinical use of ferroptosis induction in cancer treatment. Yanhua Mou and Jun Wang contributed equally to this work. Ferroptosis was first proposed by Dixon as a novel cell death in 2012 . Unlike autophagy and apoptosis, ferroptosis is an iron-dependent and reactive oxygen species (ROS)-reliant cell death with characteristics mainly of cytological changes, including decreased or vanished mitochondria cristae, a ruptured outer mitochondrial membrane, and a condensed mitochondrial membrane [2, 3, 4, 5, 6]. These cell abnormalities resulted from the loss of selective permeability of plasma membrane due to intense membrane lipid peroxidation and the occurrence of oxidative stress (Table 1) . Researches indicated that ferroptosis could be triggered by diverse physiological conditions and pathological stresses in humans and animals . Ferroptosis is gradually accepted as an adaptive feature to eliminate the malignant cells. It plays a pivotal role in the depression of tumorigenesis by removing the cells that are deficient in key nutrients in the environment or damaged by infection or ambient stress . Studies have shown that the classic oxidative stress pathway was an important causative factor to induce ferroptosis. Although cancer cells are under continuous oxidative stress with an exquisite balance between thiols and catalytic iron, ferroptosis does not often happen in the cancer development . The underlying molecular mechanisms remain poorly understood. 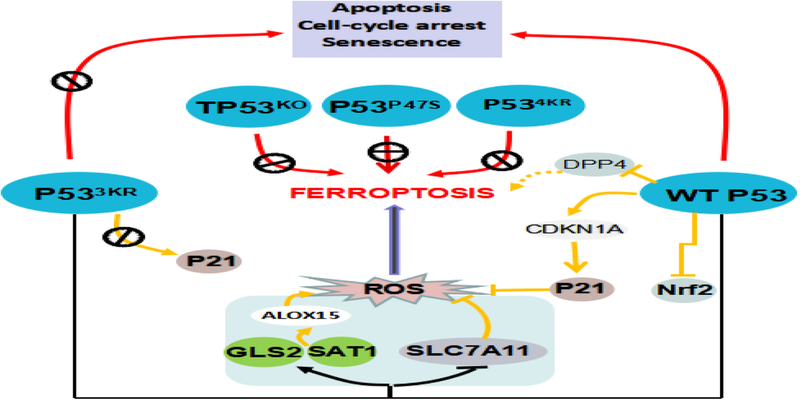 We herein review the occurrence and regulation of ferroptosis in various cancer cells. The opportunity and challenge of cancer treatment based on ferroptosis will be detailed, which was desired to prosper new strategies for cancer therapy of clinical value. Ferroptosis was first observed in oncogenic Ras-expressing human foreskin fibroblast cell line by a battery of small compounds considered as ferroptosis-inducing agents (FIN), including erastin and Ras-selective lethal small molecule 3 (RSL 3). With the following studies, the relationship of Ras oncoprotein with ferroptosis becomes agnostic. Some Ras WT cells including fibrosarcoma cells, kidney tubule cells, and T cells are vulnerable to erastin, but the RMS13 rhabdomyosarcoma cells with Ras mutation were resistant to erastin and RLS3. Indeed, the ferroptosis inducer artesunate/erastin can promote ferroptosis in a Ras-reliant way in pancreatic cancer or transformed fibroblastic cells, while in a Ras-independent manner in leukemia cells [6, 11]. Emerging evidence implicated that ferroptosis may be an adaptive process which was critical for eradicating the carcinogenic cells . More clues for this role of ferroptosis can be derived from recent researches of the tumor suppressor P53 (TP53). The acetylation-defective mutant TP533KR lost the ability to induce cell senescence, apoptosis, and cell-cycle arrest, which were the main functions of TP53 in tumor suppression. Impressively, TP533KR can still hold the capacity of inhibiting tumorigenesis due to its ferroptosis induction [12, 13, 14]. An argument does emerge that P53 expression may promote, limit, or detain the outset of ferroptosis in certain cells or conditions (Fig. 1). These opposite jobs of p53 in operating the process of ferroptotic cell death were executed by different mechanisms, including effects on metabolic genes transcription, post-translational regulation or by virtue of P53-P21 axis [15, 16]. The bidirectional regulation of ferroptosis by P53 in a cell-specific or context-dependent manner needs to be further investigated. Moreover, it is still obscure that what kind of role P53-target genes take part in manipulating of the ferroptotic cell death ? Ferroptosis is programmed necrosis mainly triggered by extra-mitochondrial lipid peroxidation arising from an iron-dependent ROS accretion. Excessive iron originally from aberrant iron metabolism or maladjustment of two major redox systems (lipid peroxidation and thiols) was the main incentive factors of ROS production. Glutathione (GSH), a thiol-containing tripeptide, synthesis is determined by the constant import of cysteine (Cys2) by the cell surface Cys2/glutamate antiporter xCT (Fig. 2). The activation of Ras-mitogen-activated protein kinase (MEK) signaling can attribute to the sensitivity of cancer cells to ferroptosis, resulting from its promoting iron abundance in cancer by governing the expression levels of the transferrin receptor and ferritin [2, 7, 8]. And the overactive Ras-MEK pathway may enhance ROS generation via inhibiting cystine (Cys2) uptake or mitochondrial voltage-dependent anion channel 2/3 (VDAC 2/3) and consequently sensitize cancer cells to ferroptosis [18, 19]. But scientist and skeptics argued that the conclusion is unreliable because the MEK inhibitor U0126 was used in these above studies. Compared with U0126, the special MEK1/2 inhibitor, PD0325901 cannot halt cell ferroptotic cell death induced by FIN. So MEK activity is not indispensable for ferroptosis [20, 21]. Other signal pathways were also pinpointed to regulate the process of cell ferroptotic death, e.g., Keleh-like ECH-associated protein 1 (Keap1)-nuclear factor erythroid 2-related factor 2 (Nrf2), lymphoid-specific helicase (LSH), Egl nine homolog 1 (EGLN1)/cellular myelocytomatosis oncogene (c-Myc), mevalonate (MVA), sulfur-transfer, mucin 1 C-terminal (MUC1-C)/system xc- (xCT) and heat shock factor-1 (HSF1)-heat shock protein beta-1 (HSPB1) pathway . RNAi against Fms-like tyrosine kinase 3 (Flt3) saves cells from ferroptosis by limiting lipid peroxidation and inactivating p22phox which back the role for Flt3 kinase in ferroptosis. A new study indicates that adenosine 5′-monophosphate-activated protein kinase (AMPK)-mediated the phosphorylation of Beclin1 (BECN1) directly blocks the activity of system xc- and thus results in the occurrence of ferroptosis [22, 23]. Recent investigations have unraveled a perplexing network in the ferroptosis regulation which was shown in Fig. 3. Interestingly, microRNA and long non-coding RNA (lncRNA) are increasingly recognized as the crucial mediators in the regulation of ferroptosis (Table 2). The cytosolic lncRNA P53RRA can promote ferroptosis via nuclear sequestration of P53. P53RRA interplays with the RNA recognition motif (RRM) domain of Ras GTPase-activating protein-binding protein 1 (G3BP1), resulting in the combination of G3BP1 with P53, which cause more P53 custody in the nucleus and less sequestration of p53 in the cytoplasm . P53RRA increased the intracellular concentrations of iron and lipid ROS by means of the augmented P53 pathway. Taken together, the cytosolic P53RRA-G3BP1 is a novel mechanism for inducing ferroptosis in lung adenocarcinoma. Restraining ROS level by targeting NOX4. In melanoma cell lines G-361 and A375, miR-9 can inhibit ferroptosis via targeting glutamic-oxaloacetic transaminase 1 (GOT1), an enzyme via glutaminolysis converting glutamine (Gln) ultimately to α-ketoglutarate (α-KG), which can promote ROS accumulation and thus irritate ferroptosis . Knockdown miR-9 elevated the level of GOT1 and a-KG, which subsequently increased the sensitivity of cells to erastin- and RSL3-induced ferroptosis. Intriguingly, the other study showed that miR-137 impedes ferroptosis through directly suppressing solute carrier family 1 member 5 (SLC1A5), which is a major receptor for Gln uptake . Knockdown of miR-137 can enhance the antitumor activity of erastin by enhancing ferroptosis. As a specific light-chain submission of the Cys2/glutamate (Glu) antiporter, solute carrier family 7 member 11 (SLC7A11) plays a critical role in the negative regulation of ferroptosis. Researches showed that miR-375, miR-27a, miR-26b, and As-SLC7A11 (antisense lncRNAs) could suppress the transcription of SLC7A11 mRNA and impair the strength of its protein [27, 28, 29, 30]. So, it is plausible that these miRNAs can promote ferroptosis by targeting SLC7A11. The Nrf2 is the vital inhibitor of ferroptosis due to its ability to inhibit cellular iron uptake, limiting ROS production, and upregulating SLC7A11. First, miR-7 and miR-200a readily induce the activation of the Nrf2 pathway by repressing Keap1 expression [31, 32]. Contrastingly, miR-28 suppresses Nrf2 expression in a Keap1-independent way . Second, both miR-101 and miR-455 can promote Nrf2 nuclear accumulation by targeting Cullin-3 (Cul3) [34, 35]. Finally, miR-153, miR-142-5p, miR-27a , miR-144 , miR-93 , miR-34a , miR-365-1, miR-193b, and miR-29-b1  can decrease Nrf2 level through different mechanisms. These results indicated that miRNA might modify ferroptosis by means of regulating the expression of Nrf2. It was confirmed that iron overload could contribute to ferroptosis in cancer. The iron metabolism-related genes, such as transferrin (TF), transferrin receptor 1 (TFR1), ferroportin (FPN), divalent metal transporter 1 (DMT1), ferritin heavy chain 1 (FTH1), and ferritin light chain (FTL), were the critical mediators in the ferroptosis procedure. Based on the existing research findings, miRNAs were also involved in the regulation of iron export, storage, utilization, and uptake. MiR-20a and miR-485-3p can reduce iron output by targeting FPN genes [41, 42]. MiR-210 and miR-152 inhibit the expression level of TFR, thereby reducing the uptake of TF [43, 44]. Concurrently, the expressions of miR-200b and miR-Let-7d effectively reduce iron accumulation by inhibiting the expression of FTH and DMT1-iron-responsive element (IRE), respectively [45, 46]. Beyond that, previous studies have confirmed that ROS generation requires the activation of polyunsaturated fatty acids (PUFAs) by Acyl-CoA synthetase long-chain family member 4 (ACSL4) and lysophosphatidylcholine acyltransferase 3 (LPCAT3). MiR-3595 , miR-205 , miR-224-5P , miR-19b-3p, miR-130a-3p, miR-150-5p, miR-144-3p, miR-16-5p, miR-7a-5p, and miR-17-5p  can decrease the expression of ACSL4. It is conceivable but not yet demonstrated that these miRNAs can regulate ferroptosis by targeting ACSL4. Ultimately, ROS is the indispensable molecule in the process of ferroptosis. Previous studies have confirmed that miRNAs are closely related to redox signaling and ROS production, and we can further speculate that miRNAs can regulate ferroptosis by regulating the expression of ROS. MiR-206 significantly induces ROS accumulation by binding to the mRNA of superoxide dismutase 1 (SOD1) . MiR-155 increases the generation of ROS by inducing Foxo3a deficiency . Also, miR-25 and miR-448-3p have been proved to reduce ROS level by targeting the nicotinamide adenine dinucleotide phosphate-oxidase (NOX) [53, 54]. Apart from apoptosis and autophagy, other programmed cell death such as programmed necrosis was discovered. Ferroptosis, as well as necroptosis, parthanatos, and pyroptosis, are all belonging to the programmed necrosis, which was carried out by a specific program of genetically encoded cellular machinery demolishing the cell in an ordered fashion . Over the latest 5 years, an astonishing boost in our perception of ferroptosis has been seen, and it was linked with apoptosis, autophagy, and other programmed necrosis which are tentatively investigated. Ferroptosis and apoptosis: switch, synergism, or antagonism? Recently, a growing research suggested the interconnection of ferroptosis and apoptosis. Besides preventing tumorigenesis by cell-cycle arrest and cell apoptosis induction, the canonical tumor suppressor protein P53 can also induce ferroptosis in certain conditions. Zheng et al. designed a novel type of P53 complex named metal organic network-P53 (MON-P53), which is tannic acid integrated with ferric ions forming MON on the external of the P53 plasmid . When MON-P53 was internalized, ferric ions can induce Fenton reaction which will cause ROS generation. In vivo and vitro experiment, the dominant ferroptotic cell death, apart from cell apoptosis, was observed in the MON-P53-treated cells. The tumor growth was suppressed, and the life span of tumor-bearing mice was also prolonged. Therefore, this approach will direct a ferroptosis/apoptosis hybrid anti-cancer therapy . 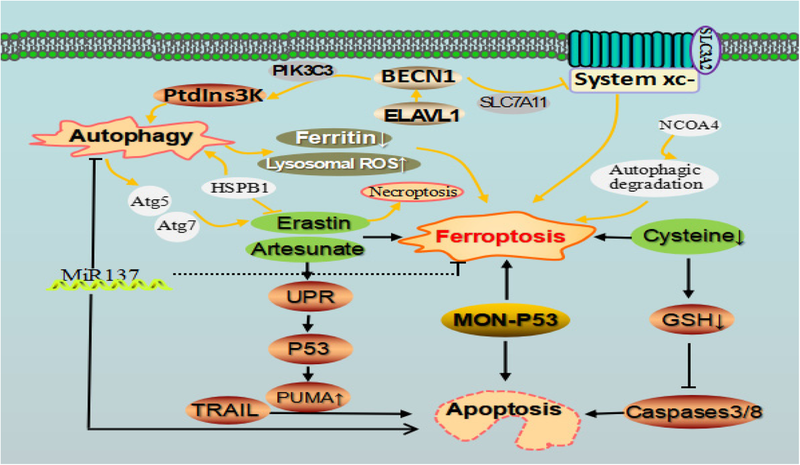 Conversely, ferroptotic agents such as artesunate and erastin can induce the unfolded protein response (UPR) which sequentially promotes the expression of P53 upregulated modulator of apoptosis (PUMA) via C/EBP-homologous protein (CHOP) in the P53-independent way . PUMA can enhance the function of apoptotic agent tumor necrosis factor-related apoptosis-inducing ligand (TRAIL) in promoting cell apoptosis (Fig. 4). This observation of ferroptotic agent-mediated sensitization to TRAIL-induced apoptosis implies ferroptosis inducer combined with TRAIL can strongly augment the tumoricidal efficacy. Another opinion is that metabolic or other alterations related to the irritation of ferroptosis biochemically block apoptosis occurrence. Cells that were subjected to ferroptosis due to cysteine (Cys) deprivation have about 10% of the normal level of intracellular glutathione (GSH). The power of reduced GSH may be necessary for the cascade activation of caspases-3 and-8. Therefore, cells’ lack of GSH cannot activate caspases correctly [10, 57]. Autophagy is a lysosome-dependent degradation pathway. The study provided data that the activation of autophagy pathway can degrade ferritin and then trigger ferroptosis in cancer cells . Ferritinophagy, the autophagic turnover of ferritin, is critical to induce ferroptosis . Further study indicated that BECN1 generation from the stimulation of upregulated embryonic lethal, abnormal vision, Drosophila-like 1 (ELAVL1) was responsible for the activation of autophagy in erastin- or sorafenib-irritated ferroptosis . Autophagy can contribute to ferroptosis via the generation of lysosomal ROS and providing available labile iron via NCOA4-mediated ferritinophagy. And pharmacological blockage of autophagy weakens drug-induced ferroptosis in cancer cells. Genetic knockout of autophagy-related 5 (Atg5) and Atg7 limited erastin-induced ferroptosis by decreasing lipid peroxidation and intracellular ferrous iron levels. Significantly, blockage of nuclear receptor coactivator 4 (NCOA4), which was a choosy cargo receptor for ferritinophgay, suppresses ferritin degradation and inhibits ferroptosis. Contrarily, NCOA4 overexpression reinforces ferritin degradation and then drives ferroptosis. Autophagy supplies available labile iron via NCOA4-mediated ferritinophagy to the process of ferroptosis [61, 62, 63]. These results unraveled the molecular interactions between ferroptosis and apoptosis, and ferroptosis is an autophagic cell death process . But in the absence of ferroptosis, prolonged iron mediates ROS accumulation and triggers autophagy and then results in autosis. Ferroptosis and autophagy can motivate cell death occurrence separately in breast cancer cells with siramesine and lapatinib treatment . But contrastly, Buccarelli et al. reported that the blockage of autophagy using quinacrine can enhance glioblastoma stem cells (GSC) sensitivity to temozolomide by means of ferroptotic cell death . Recent research shows that SOCS1 is required for p53 activation and the regulation of cellular senescence. SOCS1 can regulate the expression of p53 target genes such as reducing the expression of the cystine transporter SLC7A11 and the levels of glutathione, and it therefore sensitize cells to ferroptosis . Although the mechanism among diverse types of regulated cell death has distinctive morphological and biochemical traits, some crosstalk still prevails between regulators and components of these various processes [67, 68]. The pathway of ferroptosis was linked with that of oxytosis by transactivating BH3-interacting domain death agonist (BID), the pro-apoptotic member of Bcl-2 family proteins, which converged to mitochondrial damage . MiR137 was identified as a central mediator among apoptosis, autophagy, and ferroptosis . HSPB1 is a small heat-shock protein that is crucial in controlling autophagy and ferroptosis . Erastin can simultaneously induce the ferroptosis and necroptosis in HL-60 cell line . Therefore, explicating how these pathways of regulated cell death are interplayed at the molecular level and how these pathways could be mapped and integrated will advance new ways to systematical research on this field. Discerning the critical factors such as ncRNAs should enable these processes to be therapeutically targeted and would be highly desired. The susceptibility of different types of cancer cells to ferroptosis was significantly different. NCI-60, a panel of different cancer cell lines from eight various tissue types, recommended by the US National Cancer Institute Developmental Therapeutics Program. Among them, diffuse large B cell lymphomas and Renal cell carcinoma are more susceptible to erastin-induced ferroptosis than other cancer cells from the six tissues (the breast, lung, colon, melanocytes, central nervous system, and ovary) . Some argue that the sensitivity of different cell lines to ferroptosis is different because of the difference of their basic metabolic state. Numerous studies have confirmed the pivotal role of ferroptosis in killing cancer cells and suppressing cancer growth. Further investigations showed that chemotherapeutic drugs such as cytarabine/ara-C, cisplatin, doxorubicin/Adriamycin, and temozolomide combining with the ferroptosis inducer erastin gained a remarkable synergistic effect on their anti-tumor activity . The prognosis is better than traditional chemotherapy alone. Here, we summarize the possible mechanism of ferroptosis in various cancer types and putative indictor of ferroptosis for clinical application. Ferroptosis was one of the underlying mechanisms in sorafenib treating HCC. HCC cells with the retinoblastoma (RB) protein deficiency had 2–3 times higher death rate more than that of cells with a normal level of RB protein . This susceptibility of HCC with deactivated RB protein to ferroptosis was due to the augment of oxidative stress response in cells from increased reactive oxygen concentration in mitochondria. Metallothionein-1g (MT-1G) is a novel negative regulator of ferroptosis in HCC. MT-1G knockdown contributed to sorafenib-induced ferroptosis by increasing lipid peroxidation and GSH depletion. CDGSH iron sulfur domain 1 (CISD1) and ACSL4 inhibition promote erastin-induced ferroptosis in HCC. Low-density lipoprotein (LDL)–docosahexaenoic acid (DHA) nanoparticles cause cell death in HCC cells through the ferroptosis pathway. The p62-Keap1-Nrf2 pathway plays a vital role in saving HCC cells from ferroptosis, and Ras/Raf/MEK pathway is reported to be a critically important target for ferroptosis in treating HCC . Xie et al. reported that colorectal cancer was resistant to ferroptosis resulting from the inhibition of dipeptidyl-peptidase-4 (DDP4) activity by TP53 in a transcription-independent way . P53 loss promotes DDP4 gathering to plasma-membrane and thus augments DDP4-dependent lipid peroxidation, eventually causing ferroptotic cell death. Hao et al. found that erastin irritates ferroptosis in GC cells . Ferrostatin-1 and liproxstatin-1 can reverse this effect. C-Myc increases the expression of cysteine dioxygenase type 1 (CDO1), facilitating ferroptosis occurrence. Mechanistically, CDO1 suppression leads to the resistance of GC cells to erastin-induced ferroptosis by restoring cellular glutathione peroxidase 4 (GPX4) expression and GSH levels, and also by decreasing ROS generation. Another study reported that the CD44 variant (CD44v) stabilizes xCT at the plasma membrane and increases Cys2 uptake for GSH synthesis, blocking the ROS-induced stress signaling, and thus confer to ferroptosis resistance in GC cell [74, 75]. Ovarian cancer cells are characteristics of ferroptosis susceptibility because of excess iron overload by its tumor-initiating cells (TICs), which have overexpressed TFR1 and decreased iron efflux pump FPN level . Artesunate (ART) can induce ferroptosis in a ROS-dependent way in ovarian cancer. Ferrostatin-1 can significantly reverse ART-induced cell ferroptosis, but transferrin pretreatment augments the ferroptosis of ovarian cancer cells induced by ART via enhancing cellular iron level . Erastin induces ferroptosis in Ras-carrying human prostate adenocarcinoma cells. 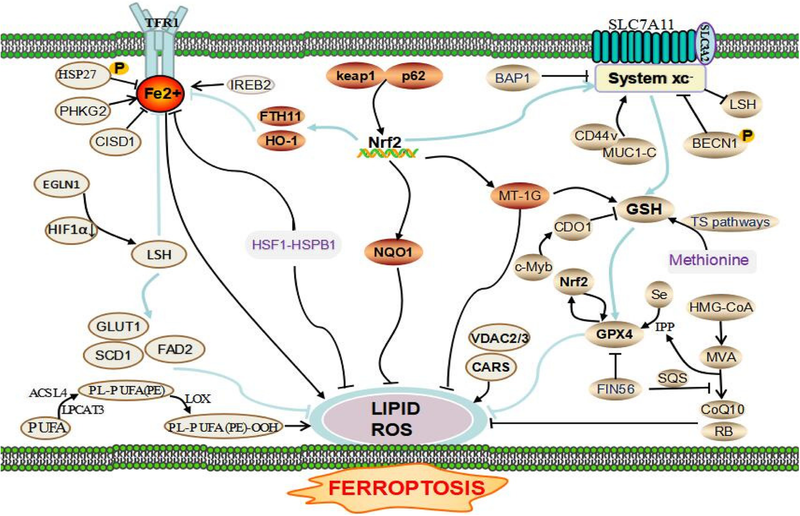 The phosphorylation of HSF1-dependent HSPB1 contributes to the ferroptosis resistance to erastin through inhibiting lipid ROS accumulation and iron uptake . HSPB1 inhibition specifically increased erastin-induced ferroptosis by facilitating iron accumulation from the upregulation of TFR1 and slight reduction of FTH1 expression. Ma et al. 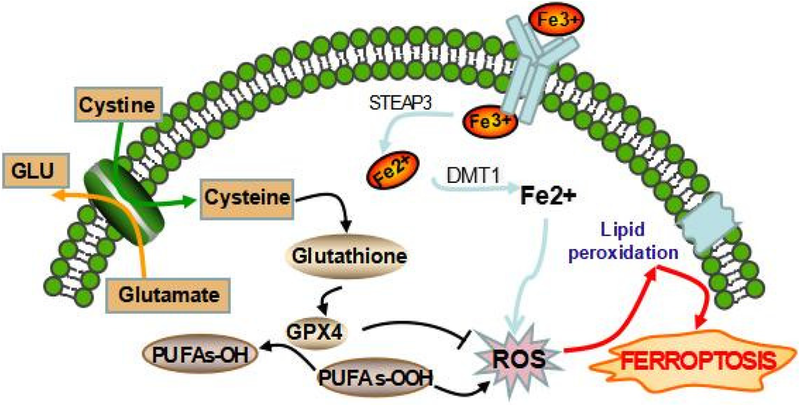 reported that siramesine and lapatinib induce ferroptosis by increasing iron-dependent ROS productions, and CDO1 overexpression can exacerbate ferroptotic cell death by the further accumulation of high-level ROS result from the decreased GSH levels in breast cancer cells . In contrast, MUC1-C can upregulate the GSH expression by its formation of a complex with CD44v, which cause the cripple of ferroptosis in breast cancer cells . Ferroptosis of lung cancer cell was first induced by erastin in the K-ras mutated A549 cells . And the following report shows that erastin sensitizes lung cancer cells to cisplatin in ferroptosis manner by GSH reduction and GPXs inactivation . Cysteine desulfurase (NFS1), as an iron-sulfur cluster biosynthetic enzyme, can protect cells from ferroptosis under the high-oxygen tension by sustaining the iron-sulfur cofactors. Coinhibition of NFS1 and Cys transport can evoke ferroptosis in vitro and suppress tumor growth . High level of GSH biosynthesis is essential for RMS cells to grow and become multidrug resistant. GPX4 inhibition using RSL3 and erastin can induce ferroptosis in RMS13 cells by lessening GSH level . Another possible reason for high susceptibility of RMS13 cell lines to erastin and RSL3 was related to its higher activity of intrinsic Ras/extracellular signal-regulated kinase (ERK). But contrastingly, the RMS13 cells with oncogenic Ras mutation were resistant to the oxidative stress-induced ferroptosis. Diffuse large B-cell lymphoma (DLBCL) cells were notably one of the most sensitive to ferroptosis inducer in the eight cell lines harvested from various tissues . It is proved that the enhanced sensitivity might be due to its weakness in the sulfur transfer pathways, which causes more extracellular Cys and Cys2 required for cells survival . Yu et al. reported low-dose erastin could remarkably increase the ability of cytarabine and doxorubicin to kill non-APL acute myeloid leukemia (AML) cells by irritating both necroptosis and ferroptosis . Since erastin, a novel compound is found in human tumor cells in 2003 . It was first identified as a ferroptosis inducer in 2012 , several clinical drugs have also been found to hold a capacity of inducing ferroptosis in cancer cells. SSZ is recently recognized as a system xc- inhibitor . xCT expression has circadian rhythm and the expression of TFR1 was affected by the circadian organization of molecular clock. Bmal1 and the clock regulate the circadian rhythm of xCT expression. The clock-controlled gene c-Myc rhythmically activated the transcription of the TfR1 gene. SSZ has been reported to disrupt the circadian rhythm of transferrin receptor 1 gene expression and thus it was plausible that SSZ may affect iron metabolism [82, 83, 84]. Toyokuni et al. report that sulfasalazine inhibits Cys2 uptake via system xc-, resulting in ferroptosis in glioma cells . Based on the circadian rhythm of xCT, SSZ has different effects on inducing ferroptosis at various times. But some argued that ferroptosis was not observed in the mouse embryonic fibroblasts treated with sulfasalazine . One reasonable interpretation was the discrepancy of different cell lines on the sensitivity to ferroptosis. ART and its derivatives can produce ROS and cause oxidative stress in cancer cells. In pancreatic ductal adenocarcinoma, head and neck cancers (HNCs), and ovarian cancer cells, the mechanism underlying the antitumor effect of ART was ferroptosis-induction . However, because of the activation of Nrf2-antioxidant response element signaling pathway, the ferroptosis induction of artesunate can be partially attenuated in some cisplatin-resistant HNCs . So Nrf2 inhibition via silencing Keap1 helps the reversal of ferroptosis resistance to artesunate in HNC cells. TMZ markedly induces system xc- expression via the activation of activating transcription factor 4 (ATF4) and Nrf2 pathway in glioblastoma multiforme (GBM) cells . Cystathionine γ-lyase (CTH), an enzyme in the transsulfuration pathway, is induced after temozolomide treatment, which can supply Cys when system xc- is blocked. Based on the finding of erastin facilitating ferroptotic cell death to temozolomide, thus, the combination of TMZ and erastin maybe a promising therapy in GMB treatment . From the screening among five chemotherapeutic drugs, cisplatin was found as a ferroptosis-inducer. Cisplatin exerts its cytotoxic effects on A549 and HCT116 cells to undergo ferroptosis by reduced GSH depletion together with GPXs inactivation . Sorafenib was first identified as a ferroptosis-inducer in HCC cell lines . System xc- inhibition and GSH depletion, the accomplices for ROS accumulation, were the main mechanism for sorafenib-induced ferroptosis. Haloperidol, as a sigma receptor 1 antagonist, can bolster erastin and sorafenib-induced ferroptosis by stimulating cellular iron accumulation, GSH depletion, and lipid peroxidation . But the overactive p62-keap1-Nrf2 pathway will weaken the ferroptosis process, owing to the target genes of Nrf2 including heme oxygenase-1 (HO-1), FTH1, and quinone oxidoreductase-1 (NQO1) which can directly inhibit ROS accretion. Nrf2 inhibition using genetic tools or drugs could remarkably reinforce the anti-tumor effect of sorafenib . Lapatinib is a tyrosine kinase inhibitor. It can incite ferroptosis in breast cancer cells when it was used together with siramesine . BAY87-2243, a robust inhibitor of NADH-coenzyme Q oxidoreductase, can promote ferroptosis in a dose-dependent manner on a series of BRaf (V600E) melanoma cell lines . Lanperisone promotes ROS production to kill K-Ras-mutant mouse embryonic fibroblasts in ferroptotic ways. And it also induces lung cancer cell ferroptotic death by inhibiting Cys2 uptake in the mouse model . Besides the clinically approved drugs, two antibiotics such as salinomycin and ironomycin can promote ferroptosis in colon cancer cells via interfering with iron metabolism allowing for ROS production . Other natural compounds such as bromelain , baicalein, artenimol, artemisinin, cotylenin A (CN-A) , and various vitamins can regulate cell ferroptotic death by acting on the lipid peroxidation and ROS occurrence (Table 3). Numerous nanomaterials have also been prospered for ferroptosis-based cancer therapy. Most of them are iron-based nanomaterials, which can be used as carriers of certain genes, such as P53 and ACSL4, to inhibit or promote the expression of certain critical molecules correlated with ferroptosis [55, 94, 96]. Erastin enhances the effect of cisplatin in NSCLCs. Effectively causes ferroptotic cell death by modulating ACSL-4 levels. How does ferroptosis interact with other cell death at the molecular level and how could these pathways be mapped and integrated into the cellular events? How does ncRNA regulate the process of ferroptotic cell death? Can ferroptosis enhance the cell immunogenicity to the host and thereby evoke an adaptive immune response, as shown in necroptotic cell death? Are the ferroptosis inducers effective in killing the cancer cells in pre-clinical or clinical trials? Collectively, ferroptosis has taken a full expectation from us to provide a new approach in anti-tumor therapies. Current researches have mainly focused on the eradication of residual or resistant cancer cells, where ferroptotic cell death emerges to be a new cell death for this purpose (Fig. 5). Conspicuously, obtaining a mesenchymal cell state (e.g., epithelial-mesenchymal transition (EMT) or cancer stem cells) has been suggested to determine metastatic dissemination and chemo-resistance . More recently, the cancer cells with the high-mesenchymal state have arisen as a vital mechanism of both acquired and de novo resistance to targeted therapies [98, 99]. 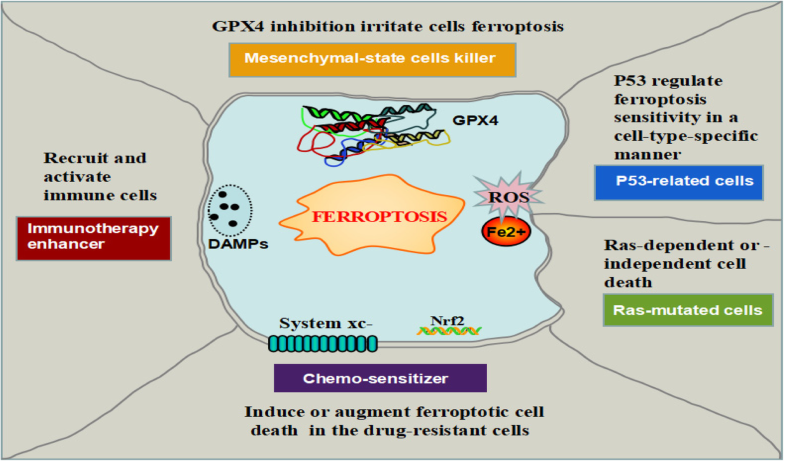 This therapy-resistant mesenchymal cancer cells have bred a state of non-oncogene addition to GPX4, which inhibition will intuitively result in ferroptosis. Consistently, persistent cancer cells which are nominated to escape from conventional cytotoxic treatment via a dormant state tumor showed an identically selective dependency on the GPX4 pathway [100, 101]. Therefore, ferroptosis might be considered a viable therapeutic strategy to reverse therapy-resistance in cancer strategy. Ferroptosis is a kind of programmed necrosis, which is accepted to be more immunogenic than apoptosis. Due to damage associated with molecular patterns (DAMPs) (e.g., HMGB1) release, ferroptosis was considered as a pro-inflammatory process . By deliverying chemoattractant signals, ferroptosis hold the ability to recruit and activate immune cells at tumor sites, which provide the possibility of ferroptosis inducer as a suitable enhancer for anti-tumor immunotherapy treatment such as checkpoint-inhibitor . Indeed, a large number of immune cells were observed inside the tumor mass when the mouse tumor xenografts underwent cell ferroptotic death induced by ultrasmall nanoparticles . However, scientist skeptics argued that ferroptosis and necroinflammation did not have an unequivocal relationship . Several studies of drug re-position suggest that “conventional” agents (i.e., SASP and artesunate) have antitumor therapeutic effects by activating ferroptosis . As a chemo-sensitizer by ferroptosis-induction, erastin can be used with various drugs such as cisplatin, temozolomide, doxorubicin/adriamycin, and cytarabine/ara-C in different type cancers. Albeit there is limited knowledge of the elaborated mechanism in the ferroptosis pathway that is engaged by current ferroptosis inducers, ferroptosis may provide a new form of cell death for approaching the reversal of drug-resistance and boosting the host immune system. 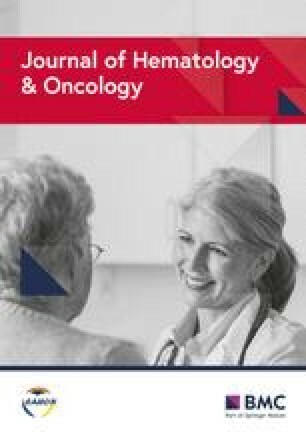 Although it was promising from the advantages of ferroptosis in cancer therapeutics, ferroptosis is still waiting for formal addressing in a pre-clinical setting and clinical achievability, partially due to the complexity of it observed in different contexts such as P53 or Ras-mutant cancer cells. Another challenge is that ferroptosis induction such as GPX4 inhibitor affects the development and function of nervous system and kidney, by causing GPX4 gene which is fundamental for embryonic development and some adult tissue homeostasis in mice . In addition, another noticeable issue is that the occurrence of ferroptotic resistance, which was originally observed in the Hela cells with the erastin treatment. The resistance mechanism was the HSP27 overactivation by suppressing cytoskeleton-mediated iron absorption . This work was supported by grants from the National Natural Science Foundation of China (81200366,81572281,81702278,81171841) and Province Natural Science Foundation of Hunan (No.14JJ6004) and the Key Subject Education Department of Hunan (594). YHM and BL drafted the manuscript and prepared the figures and tables. JW, JCW, DH, CFZ, and CJD collected the references and participated in the discussion. All authors read and approved the final manuscript.